This radar sign on Spring Hill displays the speed of a vehicle behind the camera, not the one that has just passed. 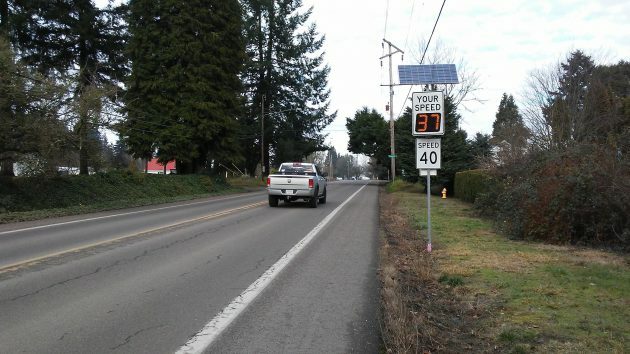 New radar speed signs have been checking drivers on North Albany’s Spring Hill Drive for about a month, and indications are they are working as intended to slow traffic down. The two signs point south and north, respectively, at the points where a 40-mph speed zone begins and stops. Benton County installed them at the urging of the Albany City Council. The council had been concerned for some time that traffic in the residential section of Spring Hill was going much faster than the posted limit, and this was a potential problem because of the many driveways and residential side streets. For a while, in 2015, a temporary and undersized roundabout at Spring Hill and Quarry Road served to slow traffic down, but Benton County insisted on removing the traffic “oval” once it was no longer needed to handle detour traffic while North Albany Road was being rebuilt. Spring Hill is a Benton County road, and the county’s public works director, Josh Wheeler, told me the radar signs were installed within the past month. They cost between $10,000 and $11,000, and the city and county split the cost down the middle. When I watched the northbound sign for a few minutes on Thursday, drivers slowed down when they approached the speed display. This was in line with what I read online about the effect these things have. People usually respond to a “feedback loop” that reflects what they’re doing in real time. In this case, drivers who are normally unaware of their speed get instant information from the signs and, typically, get off the gas if they were going a little too fast. 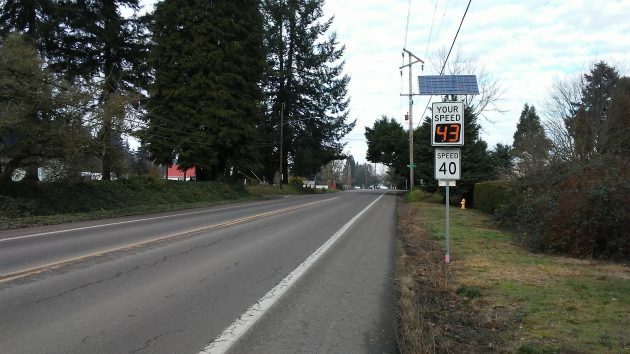 I’m not aware of any other permanent speed radar signs in the Albany area. But they might be worth considering in residential areas where vehicle speed is a problem. Radar speed signs might be even more effective than they already are if they were combined with camera-based enforcement, unpopular though this would be with the motoring public. Oregon law allows Albany and several other cities to deploy photo radar, but only if the equipment is staffed by a uniformed officer and other requirements are met. The 2015 legislature allowed Portland to set up automated photo radar on certain high-danger routes. Before slowing down upon seeing the sign, someone behind me exceeded the limit by a hair. Sounds like a good idea. Now, how about doing that on Oak St. S.E. between Queen and 9th? The speed limit is 25 mph, BUT, traffic goes much faster. Several months ago when Fairmount School became an active school again, the city sent out notices to drivers in the mail who had been clocked speeding rather than giving them citations. The warnings were VERY effective in this household. But what is the upkeep cost? And who pays? ?